Working on the beach with the warmth of the sun or in a mountain hut, no stress, and determine your own hours. Who want it? You can make this come true, many digital nomads are allready doing this. On the blog of werkenvanuithetbuitenland.nl you can read more about this and get in touch with other people who work from abroad. An inspiring blog for everyone. For Werkenvanuithetbuitenland.nl we have developed this blog to provide information about people who are working from abroad and want more information and to connect with fellow digital nomads. The blog was founded in 2011 and Andre Gussekloo ( blog owner ) wanted to go with the time. Where the old blog looked busy and sometimes it was unclear and did not work well on mobile devices. The new design is calmer and more modern and also works well on mobile devices. Posts, pages and the design can be easily managed and adapted. 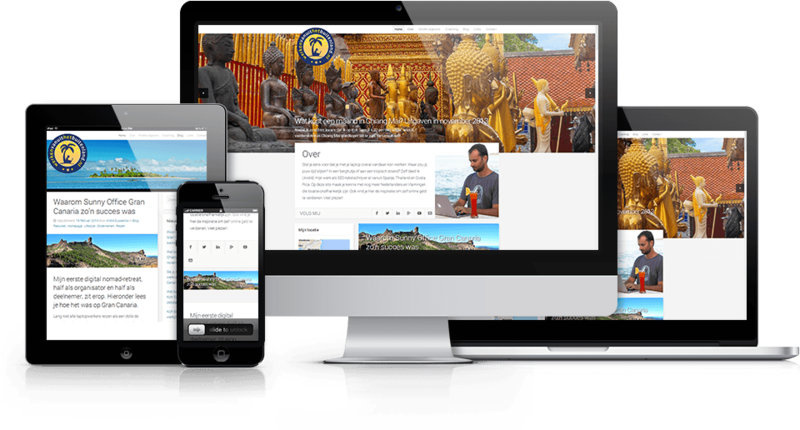 We used WordPress, a system that is ideally suited for a blog. To add photos, videos, pages and blog entries is not a problem and very easy .